Garden planters can be made of a wide variety of materials, do you know which is best, do you know the pros and cons of each? Ceramic or clay pots from plain terra cotta to fancy glazed colorful examples, are some of the most widely recognized and used garden containers, probably because they’re old technology. They do have numerous downsides however. They are expensive, and fragile if broken. What is more such pots cannot be left out all year round in places where it gets below freezing, full anyways. Supposedly you can get double fired ones that can take the cold, but I’ve never seen one for sale and they’re supposedly twice as expensive as the already expensive normal ones. Such pots are also porous (the non-glazed ones) and so need to be watered more frequently. The good thing about ceramic, where they really excel, are in style and color. Colorful glazed pots maintain their color better than the other types I will mention, and many colors are available. Plastic pots are the cheapest, and very durable. Some cheap plastic pots do become fragile in cold weather, but good ones don’t. They are nonporous and can easily retain water. Where plastic suffers is in colors and styles. Plastic containers typically are not painted (though they can be), they get colors from the plastic itself being infused. This is both good and bad, but mostly bad. It means that the entire pot is usually going to be one solid color, with no detail of variance. It also means that the colors can and will fade, really quickly, really significantly, when exposed to sun. The only good thing is that there is nothing to flake off (unless it is painted). Plastic can otherwise be left out year round, and can retain water well for those water loving plants. Metal containers are not that popular, but they do excel in a variety of applications. If you want the simple galvanized metal look you have a basic no-maintenance container. Painted metal containers are typically done with a powder coating or other durable finish, these types of paints typically do not need maintenance and last a long time. Metal can also be easily embossed with designs so you can find some really cool looking containers. The downsides of metal is that it can rust eventually, how quickly will depend on the quality of the manufacturer. For instance some “copper” containers aren’t really copper, but a thinly plated steel and they can rust. Also, sometimes the coating or painting process is incomplete and the little uncovered crevasses can then rust. Then of course, if you scratch the pot with a trowel or something, that scratched bit can rust. Metal is also more expensive than other types other than ceramic. But you can leave them out all year round. Foam pots are made by having polyurethane foam expand into a mold. They can create very intricate designs, and technically, are insulated. This would make them a good choice for a plant that needs a warmer root ball during winter than you’d get in another container (though, honestly, an container is a bad choice in such a situation). Once the form is made it is then painted. Unfortunately the paint flakes of quicker than any other type of pot I’ve found, the foam underneath yellows in an ugly fashion, and they can crack from impacts. All told, foam is my least favorite type of planter, they seem to only look good for 1 season. They can be relatively inexpensive though. Fiberglass pots are some of my favorites, they are extremely durable, available in a wide range of colors, and water tight. They do have some of the issues of plastic, colors can fade, but not that much, paint can flake, but not as badly, and while most fiberglass pots are largely one color, there are usually accent colors added. They can also be nicely textured to resemble old ceramic urns and whatnot. Price was they’re fairly inexpensive, though not as inexpensive as plastic. If you’re looking for a pot that can closely resemble ceramic without the price or durability issue, fiberglass is the one. For durability nothing beats concrete. It lasts and lasts and lasts. Concrete is my favorite kind of pot. It is somewhat porous, not very though, and holds water well. It is heavy, which can be hard to move, but it also means the wind won’t be blowing it over. Concrete, like plastic, when colored has color all the way through, unlike plastic though, it tends not to fade. Concrete, like foam, is made with molds, so it can have intricate designs on it, but unlike foam, paint adheres better (through it is rarely painted, you could paint it at home though). Concrete can be a little pricey, more than fiberglass, less than ceramic. 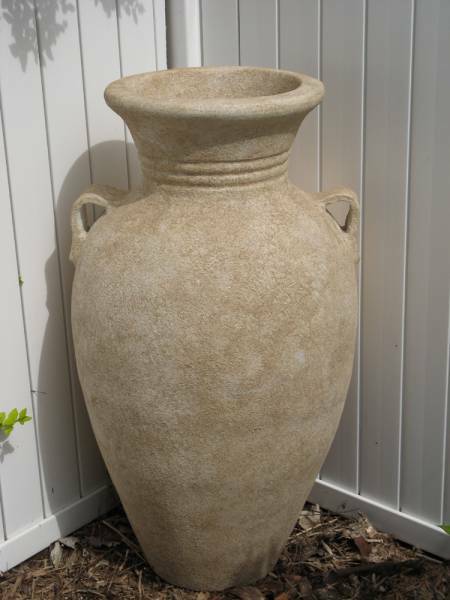 And because of the weight you’ll never find really big concrete pots (fiberglass is best for big pots) but for small and medium size containers they’re great. The only downside is limited color options, you can get uncolored, charcoal, a greenish color, and a brownish color typically. If you made one yourself (doable) you could get a wider variety of colors, and you can buy concrete paints and stains. Wooden containers, usually boxes or barrels, are fairly uncommon nowadays, and while they do have a rustic charm, they are the least durable of the lot, with rot and warping and pests all being a problem. It is not something I would recommend using, and wood is also fairly expensive, especially rot resistant woods. So there you go, those are all the common materials used for garden containers, now hopefully when you’re at the garden center picking one out you’ll be better equipped to make a decision on which to buy. I tend to use ceramic. I like the look the best! I have found some self-watering planters called [URL=http://www.newprocontainers.com/lechuza-planters]Lechuza[/URL] planters. These make caring for potted plants much easier. I am still experimenting with water contorl, but overall the results are great. I have been using lovely sandstone pots made on Vancouver Island, for quite a few years now. They are just as good as concrete but much more elegant with Grecian figures raised on the sides. They stood up to several severe winters, just left out with the soil still in them. They were available in several colours, I chose natural sandstone. We are using plastic and so far so good. I had bad experience when using wood container. It is not for water resistant. 4 months after struggle for the wet weather my wood container wrecked. What a fantastic planter! Always looks good in the garden. I also like granite ‘trough type’ planters if you can find them..! We use a combination of plastic (mainly for getting things going and transferring plants as they grow) and ceramic (where we actually want the plants to be seen and enjoyed). Although you wisely recommend against wood I do like the look of planted up wooden pots – but I agree it will get expensive to keep replacing them when the rot sets in. It is always nice to see concrete products! I started out using plastic type planters and quickly realized how much trouble they were on my lanai when they blow over on a windy day! I much prefer metal planters, even though they cost more, it is worth it in the long run if you get a quality product. I have found that wood rots and plastic breaks down in the sun cracks. I like heavy, glazed clay the best. Of course, that’s the most expensive option. Good tutorial, I like creative gardening like you listed above, a plastic planter is very affordable and easy to build and customize. I am Whitney Segura, founder and CEO of Mini Greenhouse Kits, I was wondering if you do any guest blogging here? Let me know, thanks, I will be back soon, I just wanted to introduce myself and say hey! I think the wire baskets lined with fibre are attractive. Because the soil in them dries out so fast, I line them with plastic wrap from my kitchen, leaving a one-inch slit at the bottom for drainage, then I add the soil & plants. They hold the moisture quite well.